Although the once crime-plagued St. James is benefiting from yet another extension of the State of Public Emergency, concerned residents are growing anxious as they are aware that legally, the crime-fighting tactic cannot go on for much longer. As a result, many are seeking answers regarding their safety following the impending removal of the government’s premiere crime-fighting strategy. 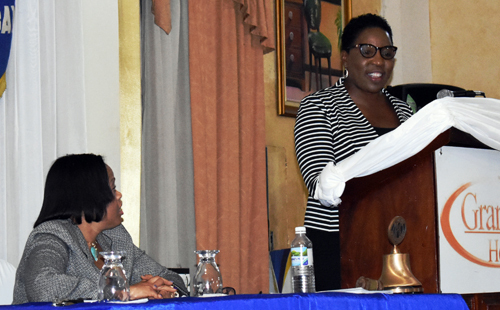 Not to worry, however, assures Deputy Superintendent of Police, Angela McIntosh-Gayle, head of the Citizen Security and Safety Unit of the Jamaica Constabulary Force (JCF), who informed last Thursday’s meeting of the Kiwanis Club of Montego Bay that not much will change in the joint forces’ operations. McIntosh-Gayle gave a detailed update concerning plans to maintain a strategic and effective operation regarding crime and violence when the emergency crime plan is lifted, revealing that the divisional crime plan will align with the Ministry of National Security’s five pillar crime-fighting strategy: to strengthen the performance and accountability framework, to strengthen violence attribution framework, to arrest and charge high value targets, to ensure effective occupation of public spaces and to strengthen the internal and external communication channel. Already established with the hope to maintain a relationship with the younger generation, she disclosed that there will be the implementation and continuation of police youth clubs in all schools starting from as early as basic school. Also, there will be mentorship programmes which have already been established in the schools which aim to provide intractable children with role models. The plan is to go into schools once per week and invite guest speakers to support and uplift the youth. This, it is hoped, will foster timely developmental socialization and interaction with children. “Let them understand that when the undesirables come around and start giving them money and telling them to go and do otherwise, they will understand that that is not the way forward. We want to groom them, capture them from that tender age,” said DSP McIntosh-Gayle. In continuation, she stated that the JCF has established stakeholder group partnerships with the mayor, police, National Works Agency, Montego Bay Chamber of Commerce and Industry, fire service, Transport Authority, Peace Management Initiative and other agencies to ensure that all corrective measures are implemented; to ensure the law and order returns to and is maintained in St. James. This, DSP McIntosh-Gayle acknowledged, will continue to be enforced after the ESM is lifted in the parish. Additionally, lawmen will proceed with the enforcement of the municipal laws, focusing on some of the small but overlooked details such as the traffic management, vending in restrictive areas and the proper use of roadways by both pedestrians and motorists. Additionally, she highlighted that the neighbourhood watch and citizens’ associations need to remain vigilant and report anything that looks suspicious or out of the ordinary in order to ensure public safety and protection of the tourism product. “We cannot have a parish that is the tourist capital of runaway crime like this,” she said. Law enforcement has been and plans to continue to use sports as an avenue to reach out to members of unstructured communities. They’ve participated in the Corner League in the volatile communities of Flanker, Norwood and Salt Spring, to name a few. The police participate and play in a football league and domino tournament in order to build relationships and not segregate members of society.